This entry was posted in Blog for Mental Health 2012, Blog Projects and tagged bipolar blogs, Bipolar Disorder, Blog for Mental Health 2012, blog projects, disorder, Mental health, mental health advocacy, Mental Health Awareness, mental health blogs, Mental Health Community. Bookmark the permalink. i made the post. thank you for doing this! 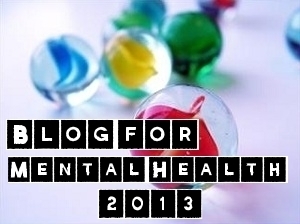 I’m going to start working on the graphic for Blog for Mental Health 2013 soon. I think it would be important to get it circulated before 2013 even gets here. Great post. Wonderful to see more bloggers spread mental health awareness through their content. Thanks for sharing. Hey, thanks! I really appreciate the enthusiasm for this project! I love when people take the same interest in mental health awareness. I have the badge, joined early in the year. Awesome. I’m sorry I haven’t been on this. I know I said I was going to do this a long time ago, but well, yeah. Major breakdown over the last six months. Six months, can you believe that? Anyway, I’m ready to get back up on the horse and begin the crusade again!